Lauren Dickey: Is Taiwan the Next Democracy in Crisis? Lauren Dickey is a research associate for U.S. foreign policy at the Council on Foreign Relations. Taiwan’s ruling Kuomintang party (KMT) has caused quite the kerfuffle. On Monday, March 17, the KMT retreated from an agreement with the opposition Democratic Progressive Party (DPP) to push through a service trade pact with mainland China. The two parties had previously agreed to conduct an itemized review of the trade pact, an agreement the KMT has now chosen not to uphold over claims that the DPP is actively blocking “official business” between the island and Beijing. The KMT’s move may come back to affect domestic politics and haunt cross-strait relations. If approved, the trade pact will supplement the 2010 Economic Cooperation Framework Agreement by further dropping barriers on service trade, allowing China to invest in sixty-four of Taiwan’s service sectors and send workers to Taiwan on renewable visas. Opposition parties and civic groups—including the DPP and Taiwan Solidarity Union (TSU)—argue that the trade agreement would not only allow China to influence Taiwan’s governing system, but that the economic stipulations would benefit big corporations to the detriment of local Taiwanese enterprises. The KMT’s move to circumvent interparty consensus could be a costly one; such actions not only undermine Taiwan’s democracy but also demonstrate a fundamental, and continued, Taiwanese resistance to ending up in Beijing’s fold. During a March 18 evening rally outside the government offices, popular discontent with this democratic leapfrogging translated into action as several hundred protestors stormed into and barricaded themselves inside of the Legislative Yuan, Taiwan’s parliament. While corruption and political protests are common in Taiwan, a takeover of parliament is unprecedented. Countless YouTube videos and live streams show the students blocking entrances with chairs and raising banners reading “refuse to allow the trade pact to clear the legislative floor.” Police have so far been unable to remove the protestors. The ongoing student occupation is expected to continue until March 21, when a floor meeting is scheduled. So what does this mean for Taiwan’s democracy? First, many Taiwanese are clearly willing to hold their government accountable. On Monday, when the KMT cut short the bipartisan review of the trade agreement, democratic processes were skirted, if not altogether ignored. Student protesters in the Legislative Yuan are exercising their democratic right by demanding a comprehensive review of the agreement that was promised. With sixty-six percent of Taiwanese preferring to support the current state of cross-strait relations, concerns about becoming too easily manipulated by Beijing linger. 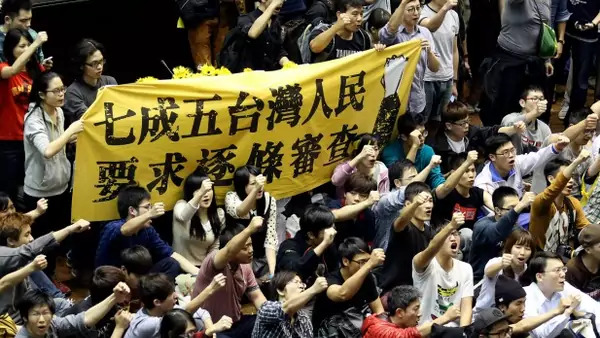 The “occupy” movement is thus a chance for Taiwanese citizens to raise these concerns and to apply brakes to Taipei’s relationship with Beijing, thereby giving the opposition time to propose a “better agreement” than the current trade pact. Second, public opposition to Taiwanese president Ma Ying-jeou is likely to continue. With an approval rating of 12.8 percent, the lowest since his inauguration, broad discontent will continue after President Ma’s under-the-table hustling of the trade agreement with China. The KMT’s unilateral decision to push the trade pact through hurts relations with the opposition DPP. Not allowing full review of the trade agreement has fueled public perceptions that core KMT leaders are sacrificing Taiwanese interests to strengthen ties with mainland China. The protests surrounding the trade pact agreement thus create opportunities for the DPP in both this fall’s local elections and the 2016 presidential elections. Third, the implications of these protests for cross-strait relations should not be underestimated. Not only will the Taiwanese be skeptical of top Taiwanese leaders when they conduct negotiations with Beijing, but the island will be in no rush to reach subsequent agreements with mainland China. The current occupation movement is proof that a portion of the Taiwanese public feels disenfranchised by its government. It is one thing to have the parliamentary approval process expedited; but when the agreement is not given a full review, leaving the island susceptible to future political or economic influence from Beijing, it is hardly surprising that protests have erupted. Few are ready or willing to see Taiwan become the next Hong Kong. The Taiwanese know well the challenges of democracy building. These protests will be another learning experience for Taiwan, albeit one with unavoidable consequences for relations with mainland China. As President Ma decides how best to respond to the current protests, he certainly knows Beijing will be watching. If the trade agreement is reconsidered, this would call into question both Taiwan’s ability to implement cross-strait agreements and Beijing’s use of cooperation strategies toward Taipei.